AZ Supplies brand products are made in the USA! Why pay more for cheaper product with a high defective rate You will end up having to send it back to the manufacturer. Your time is valuable. Get a quality product that you KNOW will work. Purchase the AZ Supplies Sharp MX-23NT (B C M Y) Toner Cartridges 4 Color Set and experience the difference! All AZ Supplies brand products are backed by '100% Quality Satisfaction' 1 year warranty against defects in materials and workmanship for all toner products. Free tech support for any problems for all AZ Supplies brand products.The use of AZ Supplies brand replacement laser toner cartridges and supplies does not void printer warranty. Premium Quality Replacement Toner Cartridge is made by ISO9001 Certified Factory to Meet or Exceed OEM Standards. These units are manufactured 100% brand new with all new parts including OPC drums, wiper blades, a smart chip and other internal parts, they are an economical alternative to expensive OEM Sharp MX-23NTBA,MX-23NTCA, MX-23NTMA, MX-23NTYA laser toner cartridges. The compatible toner cartridge will produce the same amount of page yield as an OEM cartridge would. This is a Compatible Sharp MX 2310U, 2616N Toner Cartridges 4 Color Set guaranteed to perform with Sharp Laser Printers. It replaces the original Sharp MX-23NT (B C M Y) Toner Cartridges 4 Color Set . The compatible replacement Sharp MX 2310U Black Cyan Magenta Yellow. The use of compatible replacement Cartridges and supplies does not void Printer Warranty. Our Compatible SharpMX 23NT Toner Cartridge is a replacement for OEM Sharp MX-23NTBA,MX-23NTCA, MX-23NTMA, MX-23NTYA. We offer a 100% Quality Satisfaction Guarantee on our Compatible Sharp MX-23NTBA,MX-23NTCA, MX-23NTMA, MX-23NTYA Laser Toner Cartridges and supplies. 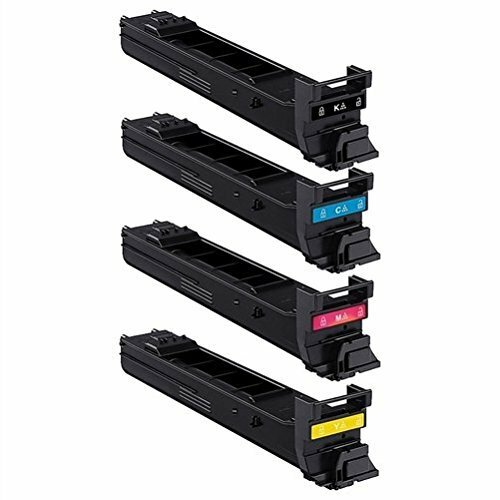 For use in the following printers: Sharp MX 2310U, 2616N, 3111U, 3116N.